Here are the breeds recognized by the CKC in the Hound Group. At the bottom see some of our club members with their Hounds. Club Member Debra Hull won Best in Specialty with her homebred GCH Hullabaloo's Breath of Spring CGN 2012 Basset Hound Club of Canada's National Specialty. 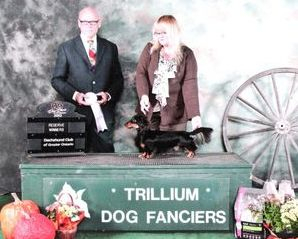 Club Member Shelley Grady showing her Miniature Long Haired Dachsund to "Woody" to Reserve Winner's Dog at the Dachsund Club of Greater Ontario Specialty in 2012. Club Member Casey Nesbitt relaxing with her gang of Irish Wolfhounds. These gentle giants love their humans!